Once upon a time, people who could do magic were burned at the stake. But magic evolved, and its practitioners were given ill-fitting tuxedos, scantily-clad assistants, and family TV shows. The same old tricks, from sawing people in half to making them disappear, were rolled out week after week to unimpressed teatime audiences. Until magic evolved again, into something cleverer, darker and more sophisticated - which is where Derren Brown came in. Brown's extraordinary brand of magic uses elements of misdirection, neurolinguistics, psychology and hypnosis, to stunning effect. He has convinced people they're inhabiting a video game, made an entire audience forget his show entirely, given people toothache just by looking at them, and appears to be able not just to read minds, but to get them to think whatever he wants. He is a brilliant talent - either that, or he's made me think that he is. Either way, it's a pleasure to be talking to him, ahead of a second series of Derren Brown: Trick or Treat. Here, Derren lifts the lid on a rather unusual element to his fan base, explains why he's not interested in stirring up controversy, and reveals the involvement of a celebrity guest in his new series. You're doing a second series of Trick or Treat. What made you want to revisit the format? I think it just felt like an interesting idea to explore a bit further rather than just moving on after just one series. And I wanted to follow each individual participant a bit more this time: so each episode follows the single narrative of that one person who's taking part, rather than jumping around doing lots of unrelated things. So we just explored it in a bit more depth. I thought this would be a good thing to stay with for a little bit longer. Much of your material creates controversy – do you revel in that, ignore it, or does it upset you? Controversy has never interested me for its own sake. It's never been anything we've aimed for. Certainly the things I've done that have created a controversy are a tiny minority of all the work I've done, it's never been anything I've courted. It's always been about doing stuff that feels dramatic, that has a resonance with people, feels as watchable as possible, or presses buttons for people. Those things often are going to be a bit controversial, or involve sensitive areas that some people might get worked up about. But I think it's important sometimes to shake things up a little bit. Also, it's hard to know to what extent people really are upset when newspapers report that they are, or whether it's just a journalist looking for a hook. Do you ever worry that you've gone too far with an illusion? For example, when the girl thought she was witnessing her own death, or the guy who thought he was being attacked by zombies. It's always been a very big thing for us that participants are very well looked after. The people who have taken part in those sorts of stunts have always, always really enjoyed it and been exhilarated by it. Even if you can make the tone of the show feel a bit reckless or a bit bleak, the reality of it is that, although it's a genuine experience for them, it's something that I want them to go away really delighted that they've taken part in, and delighted that they've done something extraordinary. It's never been anything other than enjoyable for the people who've done it, and I'm happy with that. You've got David Tennant appearing in the new series. How did that come about? I met him at a party. He was incredibly charismatic, absolutely lovely, which I think is a very important thing in life, and I really warmed to him. I got from that conversation that he really enjoyed the show, which I always find genuinely surprising and touching. And we were writing the series at the time, and thought it would be fun if one of the participants was well known. He's still treated the same as any other participant, so he never gets to find out what's coming, or when, which is fun. He's very open and unguarded, which is terrific. Do you find that you get bombarded by people wanting you to do a trick on them? Actually, most people are perfectly nice, it's not a problem. Although the other day there was a 'homeless' guy in the street who told me he was my biggest fan, and had all my dvds, and never missed a show – I find I'm very popular amongst the homeless community who still have televisions and DVD players. Normally people just want to say hello. I do get asked to show people tricks sometimes, and always decline, and normally that's with businessmen in groups or people who want to show their status to the people they're with. Most people are much nicer. It must be hell being a comedian, and people expecting you to be continually funny. Much of your work is about informing people about techniques used by charlatans to con people. Does that side of the job give you pleasure? Yes. But it's a difficult balance. To just debunk is a very negative agenda. It either feels preachy or it isn't entertaining. I've always tried to include it gently, partly because what I'm doing appears to be quite close to all that, so there's a certain responsibility to make sure that people don't misunderstand it. But I always try and make that side of it a subtext, rather than bashing people over the head with it. Why did you decide to take part in the Richard Dawkins programme, The Enemies of Reason? Well, because I was massively flattered to be asked. He's made a couple of shows that I would love to have made myself, so the next best thing was to be in one. I don't know if he knew who I was – he's obviously very involved in his academic world, and I'm not sure if watching TV entertainment plays a big role in that. But it was a real pleasure to meet him, and a real honour to be part of a very worthwhile piece of television. You're about to do a live show in the West End. Do you get a real kick out of doing the live stuff, or is it a fairly exhausting slog? Oh, no, it's a massive buzz. I love it. It can be a bit tiring sometimes, but I actually get my afternoons to myself, which is not something I normally get at all. I actually get to sit down and read a book. It's probably my most pleasurable time of the year, seeing as I hardly get any time off. And it's so much fun doing what – without sounding too big-headed – I know is a really good show that people really enjoy. Every night I end up changing it a little bit, or discovering something new. It's a real buzz, there's adrenaline to performing on stage which you really don't get in front of the camera. With the live show, there must be more elements you can't control. Doesn't that worry you? One of the joys of the live show is that people do see the rough edges. With TV, however much you convince people that you're not using actors, or making things happen by careful editing, there will always be people who don't believe what they're watching. At the live show, we choose volunteers at random, throwing a Frisbee out into the audience and getting it thrown again, so people know it can't be fixed. And yes, if things go wrong, people can see that, which is a good thing for people to see sometimes. The nature of watching something on a little box in the corner of the room is that you are more detached from it. I always try and make the shows feel very involving, so that if you're not on the stage taking part, you still feel heavily involved in it. So what can people expect from the live show? I never like to tell people what to expect on the show. I like to leave them in the dark. But there's a lot of audience participation, and it's a lot more fun and funnier than people might expect from the TV show, which tends to be darker and more serious. But beyond that, I'm saying nothing. And lastly, you've got a DVD of your last live show, Something Wicked This Way Comes, coming out. Why should people buy it? Well, if you saw it on TV, it has some other bits that had to be taken out of the TV show. And if you don't like me, then you get to see my face pushed into a load of broken glass. So either way, you're on to a winner. 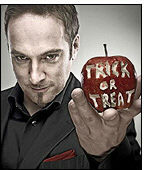 Derren Brown: Trick Or Treat is on Channel 4 on Fridays at 10pm from May 2nd 2008.